Ah I just realized that it’s been quite some time ago, since I did any sort of review, so I decided to give you a review of oné of my all time favourite mists. I am so in love with the flacon of the mist, and the cute floral detail in the background makes the whole flacon absolutely adorable. The scent of the mist which smell of Cherry Blossom & Peache, is really sweet. So if you prefer less sweet scents, Victoria Secret’s mists might not be the right choice. 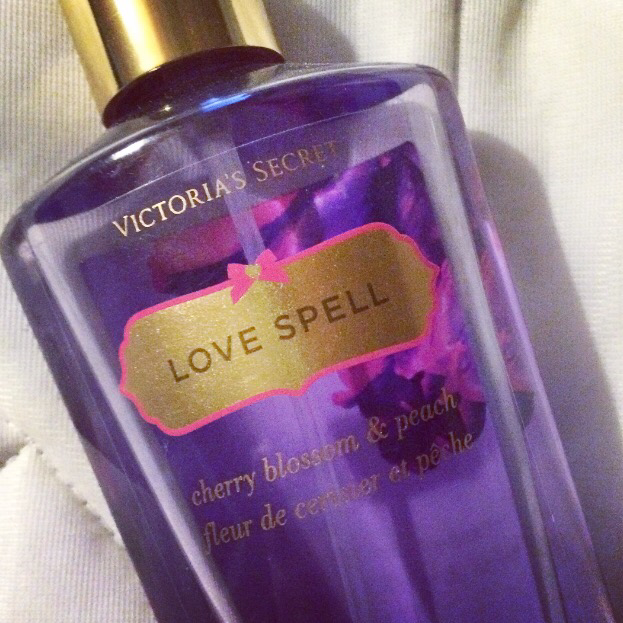 However if you do like sweet scents I will definitely recommend Love Spell. Hi sweethearts I'm Miku and the author of the blog www.molangyeonin.wordpress.com As person I have a weakness for cute things, and a sweet interest, when it comes to all from fashion, makeup, skincare, nailpolish and so on. The Korean culture especially, but also a tiny bit of the Japanese culture as well. Personally I will be quite easy to talk with, and a person who cares a little too much now and then, but I think it won't bother anyone too much, at least I hope not. Last but not to forget, thank you so much to all my loyal follwers and for all the sweet comments, feedbacks and likes. I really appreciate it.